Answering the question from the tile of this article can be done from two different, but intersecting standpoints – a technical one and a theoretical, almost philosophical one. If you start from the philosophical standpoint, your answer comes very quickly – SEO and content marketing are not separable entities, but a part of a single entity. As such, they cannot be truly separated and their complementarity is a given. You would not ask how a person’s left and right leg are able to work so well in propelling them forward, would you? If you start off all technical, you will encounter a number of ideas, practices and examples which will bring you to the same aforementioned conclusion – there is really no SEO without content marketing and no content marketing without SEO. For the purpose of this article, we will take the longer path – we will explore the ideas, practices and examples whose empiric interaction will bring us to the philosophical conclusion that SEO and content marketing are parts of the same whole, rather than two separate wholes. 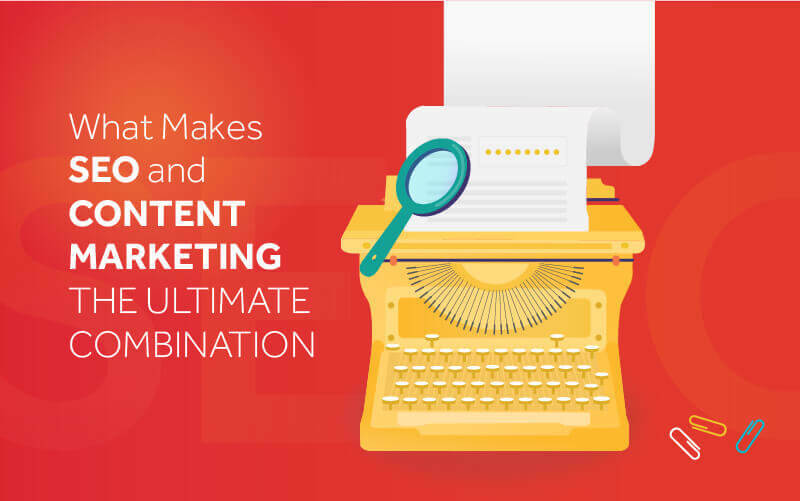 While SEO and content marketing are inseparably interconnected, it would be ridiculous to say that the two do not differ in any way. Content marketing revolves (as its name suggests) around the creation of content (not only text, mind you) which will be used to raise awareness about a certain brand and ultimately bring in new customers. It will aim to delight, inform and produce an emotional response in the consumer, pointing them towards the brand that is being marketed. SEO has a somewhat different purpose of getting a website to the best possible position in search engine results when users search for a certain keyword. It is a more technical discipline which involves a number of practices. At first glance, the distinction is very clear and one might even start thinking that the two do not have too much in common. In reality, nothing could be further from the truth. SEO, when one really boils it down, is all about keywords. The reality of the Internet and search engines is that they utilize keywords as the basic tool for organizing everything. A huge part of SEO is researching, optimizing and utilizing various keywords, key phrases, and keyword groups in order to help a website rank higher in search results. The obvious question that needs answering here is how to deploy those keywords, key phrases and keyword groups? You will feature amazing content that will feature your keywords and that will help your online presence become more prominent. Every piece of content that you will feature on your website will include keywords that you wish to rank for, strategically placed and never too numerous so as to raise suspicion. In addition to this, content marketing will provide SEO with a constant influx of indexable content which is crucial for any kind of decent SEO activity. Another huge way in which content marketing will be supporting your SEO efforts is with link building. You may have heard all kinds of stories about link building and various link building practices, but the fact remains that any SEO campaign will involve quite a bit of link building. In order for this link building to be above board and actually beneficial for your SEO metrics, it will have to lean on high-quality content, i.e. content marketing. When you have amazing content, people will link to you. Similarly, if you provide amazing content to other webmasters and blog owners, you will be doing some great guest blogging which can bring even more visits to your website. There is some SEO that can be done almost independent of content marketing, but for the most part, your SEO will be supported by some serious content marketing. One of the most important tenets of content marketing is that content is written for consumers. It is supposed to provide them with valuable information, an interesting opinion or a bit of controversy (among other things). One might think this was enough. We live in an age of utter oversaturation with content that it is almost impossible to get one’s (even stellar) content in front of enough eyes to make a difference. This is why content marketing will always be supported by SEO and why content creators will be doing some SEO of their own even if they don’t think this is the case. SEO is needed so as to get a certain piece of content in front of enough people. If you write the best article ever on big data, the fact it is the best article ever on big data is not enough. Search engines need to be convinced of this. Moreover, without at least some knowledge of SEO, content creators cannot even hope to begin to rank for their articles. Optimization for SEO has become a must for online content and there are no two ways about it. Sure, there is a chance your content might be picked up in a one-off stroke of luck, but this happens once in a blue moon. As you can see, the interplay between SEO and content marketing is much more than just collaboration. It has to do with the fact that these two disciplines have a big overlap where they become one and the same. They support each other, but they also make one another what they are.